Whether you’re traveling with a bunch of suitcases or with just a carry-on alone, there are certain travel essentials that you should never leave home without. Your travel must-haves change as you age. Gone are then days when you didn’t have to worry much about the blood circulation on your feet and legs during long haul flights, or standing in line for a long period of time, heck you can even sleep on an airport bench without any problem. Now, it’s a different story. But that shouldn’t stop you from traveling because there’s so much more to explore in the world. 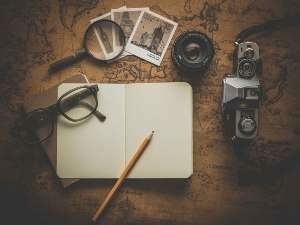 With the help of these 10 travel must-haves, you can definitely achieve a stress-free, comfortable and fun travel. Carry your passport, IDs, credit cards, tickets and cash in this belt or neck stash (which you can wear discreetly under your shirt or jacket) to make sure they’re organized, safe and close to you while traveling. 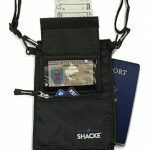 This one from Shacke is made of durable water resistant nylon, with an RFID blocking lining to protect you from theft. 2. Backup Copies of Passport, Tickets and other important documents. Make copies of these important documents and keep them in a safe place in your luggage. This will come handy in case your passport gets stole, if you need your health insurance, etc. 3. Medicines and Extra Prescriptions. There are so many styles and types of pill organizers in the market but I find this one from Lewis N. Clark the most travel-friendly. 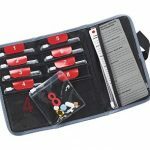 It’s light, compact and can be closed securely with 9 individually-labeled clear pouches with slide-locking closures. This is perfect when you’re in transit or in a busy crowd because it limits the possibility of spilling the pills unlike other types of organizers. It also comes with an interior mesh pocket to put your extra prescriptions which is very important. Aside from your maintenance medications, make sure to bring pain reliever, anti-allergy and diarrhea meds that are prescribed to you by your physician, in case you need it. Get an eyeglass case that you can attach to your belt, bag or carry-on luggage to have them close to you when you need them. Don’t forget to bring your eyeglass prescription too because losing or misplacing your specs is not impossible. To keep yourself hydrated and have clean, potable water ready at all times, bring your own water bottle and fill it up once you have cleared security at the airport or before you leave your hotel. This is very important for those of you who need to take medications at specific times of the day. 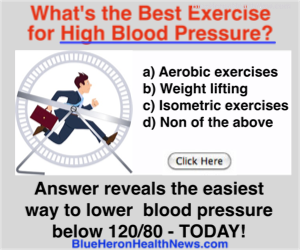 Long flights or car rides can take a toll on your circulation. Poor circulation increases your risk of swelling, blood clots and worse, Deep Vein Thrombosis (DVT). To promote good blood flow, make sure to wear a pair of compression socks or stockings, and stand up and walk up and down the aisle at least every hour while you’re on a long airplane ride. 7. Neck pillow, eye mask and ear plugs. These three travel accessories will help you rest and catch on sleep whenever you can. 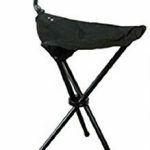 You may not need a can for now but you can benefit from the seat that it comes with. Use it while waiting in line or if you just want to take a break from all the walking and sight-seeing. Hidden germs and virus are everywhere – in the crowd, hotel rooms, public bathrooms, etc. Protect yourself from getting sick while on your trip by always keeping hand sanitizers and antibacterial wipes inside your bag. Last on the list is a pocket magnifier. This will come handy when you are in a poorly lit area and you are having a hard time reading something, like a menu in a restaurant with dim lights, for example. For more travel must-haves, check out my previous article featuring 5 Innovative Accessories for All Your Travel Woes. It’s a pity that more seniors and boomers do not travel. Especially solo travelers. The luxury tours are perfect for this. No worry about safety, or going alone. For years, I waited to travel and regret the time lost.